= Atama ni tsukete dousuru no yo! = Soreja, imi ga naijanai! =Nee gohan wa douyatet taberu no? =Mada hana ga kakurete nai shi..
= Ginkou goutou mitai janai? It’s winter and is getting very cold in Japan. 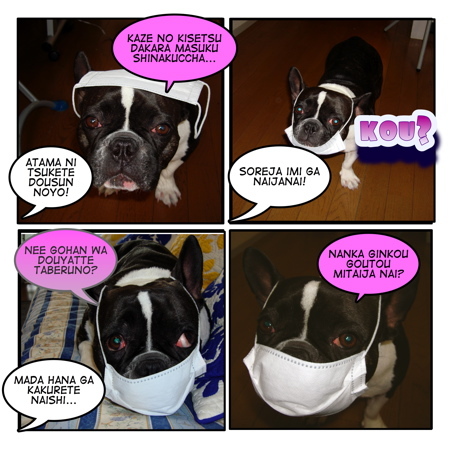 We hear a lot of people talk about 風邪 ( = kaze), cold, in our daily conversations. Japanese people often talk about weather as a conversation starter. In winter, we often mention 風邪 ( = kaze), cold, when we say good-bye. How? We’ll see in today’s lesson! We are going to check the KANJIS first!! =Jama wo shinai de kudasai. = Kaze wo hikanai de kudasai ne. = Kaze wo hikanai de ne. = Kaze no hikika ni kusuri wo nonde naosu. = to cure the cold with medicine in its early stages. = Kaze wo utsushitara ikenai kara kyou wa uchi (ie) ni imasu. = Kaze wo utsusareru to ikenai kara kyou wa uchi (ie) ni imasu. =Dare ni kaze wo utsusaretaka wakaranai. = Dare ni kaze wo moratta ka wakaranai. = I don’t know who gave me a cold. = The cold is spreading this year. •薬が効く（ = kusuri ga kiku) The medicine works. = Kaze no shoki niwa shougayu ga kikimasu. = Hot ginger drink is effective to cure colds in their early stages. Culture note : 生姜湯 ( = shougayu) and 卵酒 ( = tamago zake) , hot Japanese sake with eggs and sugar are traditional cold home remedies in Japan. = Hitogomi ni deru toki wa masuku wo chakuyou suru koto. = When you go out in a crowded area, be sure to wear a mask. = Kitaku shitara tearai to ugai wo suru koto. = When you come back home, wash your hands and gargle! We have been taught to wash our hands and gargle in the winter to avoid catching colds at school and at home. Here are some cold symptoms! =Mada hakatte inaino de wakarimasen. = Hai binetsu ga arimasu. =Netsu ga sanjuuku do mo deta. = My head hurts. / I have a headache. = Atama ga zukizuki suru. = My whole body hurts. How do you say to people who have got cold? = I sincerely hope that you get well as soon as possible. Note : “recovery” has two forms of kanjis. 1) 回復 ( = kaifuku) Recovery from disease and also be used for other things, functions, etc. 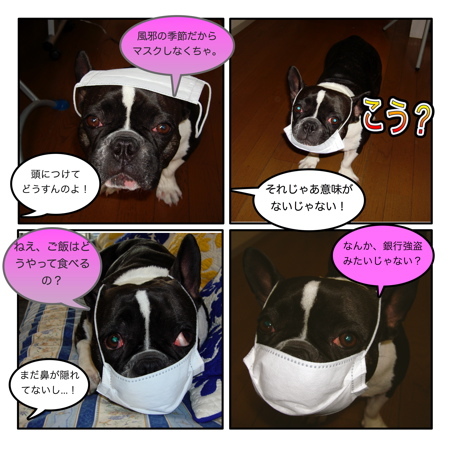 2) 快復 （ = kaifuku) We use it when we refer the recovery from a long lasting disease. To fix or to cure? Also there are two kanjis for なおす( = naosu) ! We always use B) 治す ( = naosu) to cure disease or body. = I am over my cold. Check my 笑い ( = warai) lesson)　I am doing ボケ ( = boke) here. Let me explain one thing here. = Mada hana ga kakurete nai shi.. There is a tendency to finish a sentence with し ( = shi) among young people. (Also there is a dialect to finish the sentence with し ( = shi) like in Kansai area. It is grammatically incorrect but they say that anyway. Usually し ( = shi) is used as “and” to list things or descriptions. = Kanojo kawaii shi yasashii ne. = Anata nante sukija nai shi! = Doredake benkyou shitemo wakaranai shi! If you want to study more about the usage of し ( = shi), go check this lesson. = Yappari masuku wo suruto ikigurushii desu. = As I expected, wearing a mask is suffocating! = Kaze wo hiite iru hito wa watshi ni chikazukanai de ne. = If you have a cold, stay away from me, OK? Why do we use wo in kaze wo hiku but ga in zutsuu ga suru? Is it right to say kaze ga hiku? And if possible, could you make a lesson on the difference between ha, ga, and wa? I think someone else has just asked me the usage of ~ga suru. Sometimes we use ~ ga suru to express one’s feelings or symptoms. And the difference between “wa” and “ga” is on the request list. Please wait patiently. It will take a lot of time to make that lesson. I know SOOOOO MANY people have asked me to make a lesson on that subject but I have been procrastinating. Instead of saying “kaze wo hiku”. Is it okay to say “kaze desu”. and what is the difference? But when you translate them, it’s the same. Glad to hear this lesson is useful. Isn’t the し used to explain reasons when there are several? And I’ve heard it also when the speaker only mentions one. Yes, as I mentioned in the lesson, し is usualy use when you list up something. Your lessons are so great! I have learnt a lot of colloquial Japanese from them already, and best of all they are fun to read! You are doing a great service to the Japanese-learning community. Please keep up the good work, and I look forward to your next lesson! Thank you so much for your nice comment and your donation! We really appreciate your support and yes! I will get a new bone for sure! Yukari and I are now making a new lesson. Please visit here again! This, along with all the other lessons posted, are great. Thank for you for posting them!